So the other day I decided I needed to make a scrap quilt asap. I wanted something kind of mindless to cut and sew that would use up my little crumb scraps. I’m thinking - full scrappy! Do you keep crumbs? Crumbs are square-ish scraps with sides about 1.5” - 3”. I cleared out my entire crumb collection two years ago, but here I am with a healthy population again. Shrug. That’s how it goes when you sew a lot! Guess what I chose to make? Miniature Cross Roads blocks! I referenced a tutorial for the Scrappy Cross Roads Block on Lori Holt’s blog, A Bee in My Bonnet. In order to use my smallest scraps, I’m downsizing her block quite a bit. My scrappy squares are cut 2” and my background squares are cut 3.5”. I don’t precut my scraps into any particular shape, in order to keep all my options open. 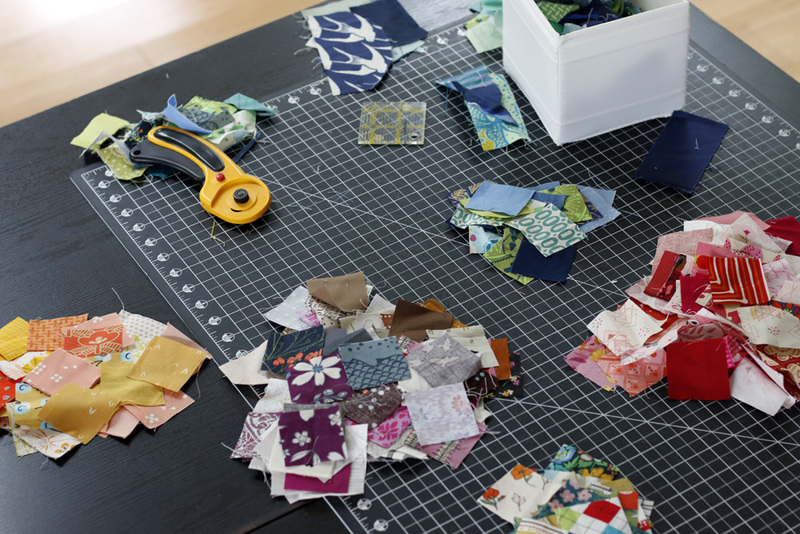 When I settled on this block, my first step was to cut all my crumbs to 2” squares. Such a satisfying first step! I actually love cutting scraps. It feels so tidy. 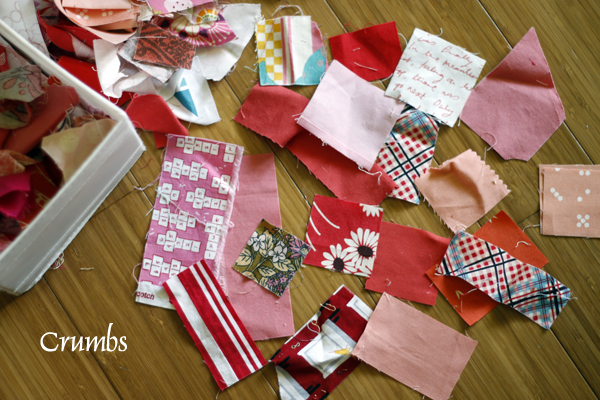 Next I sewed background squares with “easy corner triangles” a la Lori’s tutorial. I’m using low volume scraps for my backgrounds, which I’m hoping doesn’t obscure the pattern too much. 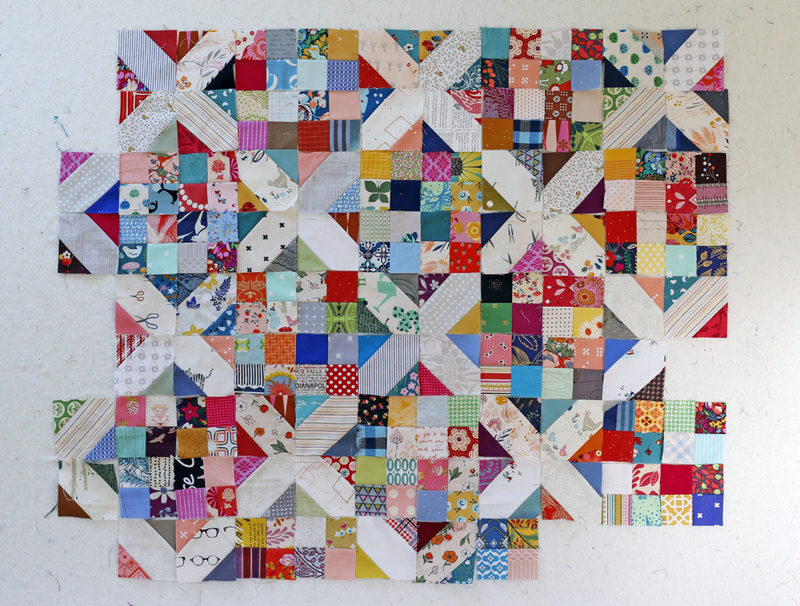 It’s surprising how many scraps a quilt like this will eat! Now I’m also cutting triangle scraps into 2” squares because I’ve used up all my crumbs. Yippee! Here’s to happy, scrappy patchwork! p.s. I am moving forward with plans to produce a Drummer Boy Dresden pattern. I’ll be testing a few block sizes soon. Thanks so much for your feedback!